Robert M. Bernstein M.D., F.A.A.D., hair restoration pioneer and Clinical Professor of Dermatology at Columbia University; and Michael B. Wolfeld, M.D., a board certified plastic surgeon, have introduced a new advanced graft selection capability of the ARTAS® Robotic System that yields a significant cosmetic improvement over prior versions. The peer-reviewed study, published in the June 2016 issue of the journal Dermatologic Surgery, found that the new robotic capability can yield 17% more hairs per harvest attempt and 11.4% more hairs per graft than the current system. The results are less wounding, less scarring, and an improved aesthetic outcome for a procedure that is gaining in popularity among hair loss patients. Drs. Bernstein and Wolfeld developed the study to measure the impact of the new functionality. Results of the bilateral controlled, randomized study of 24 patients showed that when compared to random harvesting with the current robotic system, advanced follicular unit graft selection produced more hairs per harvest attempt (2.60 vs. 2.22) and more hairs per graft (2.72 vs. 2.44). This equates to a clinical benefit of 17% and 11.4% respectively. Robotic technology to harvest grafts in a follicular unit extraction (FUE) hair transplant has been available since the launch of the ARTAS robot in 2011. Older iterations of the robot randomly selected follicular units – tiny, naturally-occurring bundles of one to four hair follicles – for extraction. In advanced follicular unit graft selection, the surgeon programs the robot to harvest only the larger follicular units in order to maximize hair content and minimize wounding. Robotic-assisted hair transplants are increasing in popularity because people understand that the basic benefit of the ARTAS robot is improved quality control over manual devices. As we continue to enhance outcomes through technical advances like advanced graft selection, Robotic Hair Transplants should become the gold standard in FUE procedures. 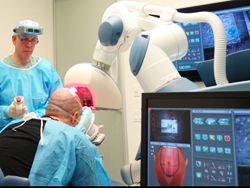 The ARTAS robot has gained in popularity as a series of advances have improved outcomes of robotic-assisted hair transplantation and made it a more compelling procedure for patients. Some of these advances include an improved optical system, refinements of the punch design, smaller punch sizes, faster punch rotation, a simplified user interface, and robotic recipient site creation. Robotic follicular unit graft selection continues this trend in making the FUE procedure more accurate in the hands of clinicians and more beneficial to patients. Bernstein Medical is a beta-testing site for the ARTAS robot and the new product feature is an outcome of the research initiated at this facility. Dr. Bernstein introduced the new technology at the 2015 ARTAS User Group Meeting in Newport Coast, CA in February 2015. Further improvements are in progress. Bernstein Medical – Center for Hair Restoration, founded by Dr. Bernstein in 2005, is dedicated to the diagnosis and treatment of hair loss in men and women using the most advanced technologies. Bernstein Medical is a beta-testing site for the study of new product features and enhancements in the ARTAS Robotic System. In 2011 it became one of the first worldwide to use the image-guided, computer-driven technology of the robot in clinical practice. The state-of-the art facility is located in midtown Manhattan, New York City where Dr. Bernstein and Dr. Wolfeld treat patients from around the globe. The board-certified physicians and highly trained clinical staff at Bernstein Medical take pride in providing the highest level of care for hair loss patients.